I have a lot of TIG welding rods. Like well over a 100 pounds. Well, I used to work for Delta Air Lines. And as a Delta employee, one of the perks was being able to purchase scrap metal for cheap. Back around 1991, Delta bought Pan Am. One day soon after Delta acquired Pan American Airlines, a a whole bunch of TIG wire showed up in the scrap yard on pallets. Hastelloy W, Nichrome V, 321 stainless, Titanium, etc. You can imagine all the different types of filler that an aircraft maintenance facility would have on hand. Only problem with that Pan Am tig welding wire was that it was color coded instead of flag tagged... and that meant it was out of compliance. so basically...all that expensive wire was about to get thrown away because it was not labeled as per Delta's process standards. I probably could have got it all for 20 bucks but I wanted to make sure no one out bid me. ... so I offered the scrap guy 100 bucks for the whole lot and the scrap guy (who went by the nickname "Rabbit") took my offer. Next thing you know, I am loading up my truck with about 200 lbs of assorted TIG rods. Well around 2004 I had a house fire. Some of that wire was ruined.. but not all. I still have way more TIG wire than the average guy...and its high time I made some holders for what I use most often. 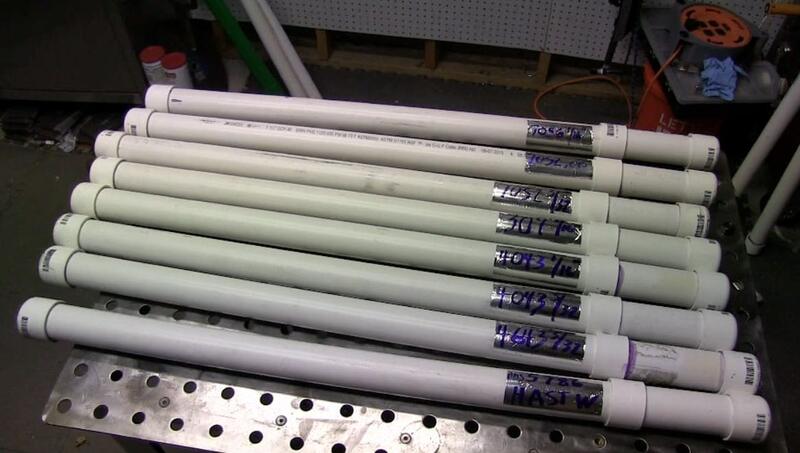 So thats what I am doing today…making tig rod holders out of PVC pipe. Since I bought 10 foot lengths and had the store cut them in half for me, these 30" and 6" dimensions worked out fine. most tig welding rods in the USA come in 36" lengths ... these holders are about 38"
The coupling is really not 100 percent necessary but it does make it easier to grab rods from the holder and only adds about a dollar to the cost per holder. I plan on making a rack sorta like a pool stick rack to hold all my tig rod holders on the peg board near my welding table. So I will just be able to grab a tube of rods and lay them on my tool cart while I do a job. er70s2, er308L stainless, er309L stainless, 4043 aluminum, and silicon bronze or aluminum bronze. er70s2 is cheap and used not only for welding mild steel, but also high strength steel and 4130 chromoly. (if you are doing coded work, you use the rod specified). er308L is used for welding 304 stainless steel which is the most common. 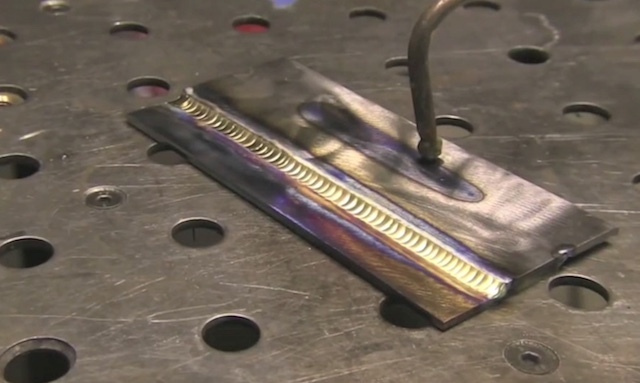 er309L is designed for welding carbon steel to stainless steel but also has lots of other uses like for when you need to weld some steel but are not 100% sure what grade steel it is...or when you need to weld over some weld that has porosity. 4043 is the most versatile aluminum tig rod because it works well on 3003, 6061, as well as silicon based aluminum castings. there are aluminum filler rod charts available to guide you in the right choice for applications such as anodizing color match but 4043 is a good all around choice usually. Silicon bronze will weld copper to brass, copper to bronze, or steel to copper and lots of other combinations. Its also good for quick fixes and art. Aluminum bronze erCuAl-A2 is stronger than silicon bronze and I like to use it for tig welding cast iron. I use Alternating current when I do that because it welds a lot cleaner and AC makes it easier not to melt the cast iron into the weld.